Snakes prefer brightly lit open areas where they can bask in the sunlight in order to regulate their body temperature (behavioral thermal regulation). Depending on the species, snakes can benefit the homeowner and gardener by eating invertebrates and rodents. Snakes may use woodpiles or the foundations of buildings as den sites during the spring and summer and as hibernation sites during late fall and winter. Small numbers of snakes may congregate during the breeding season in preferred basking areas or in hibernating sites. 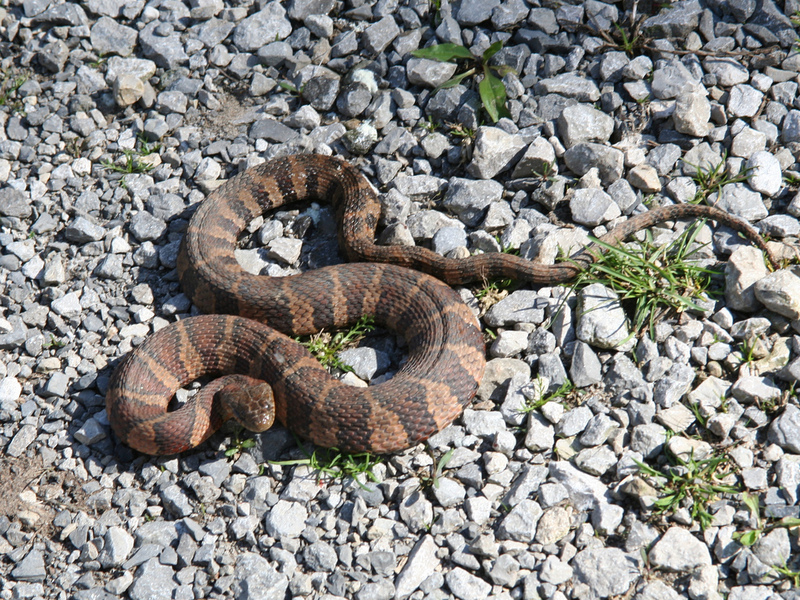 Several of the non-venomous snake species are commonly misidentified as one of the four venomous species found in Illinois. Since a number of species of snakes vibrate their tails when they feel threatened, people sometimes mistakenly confuse them for a rattlesnake. 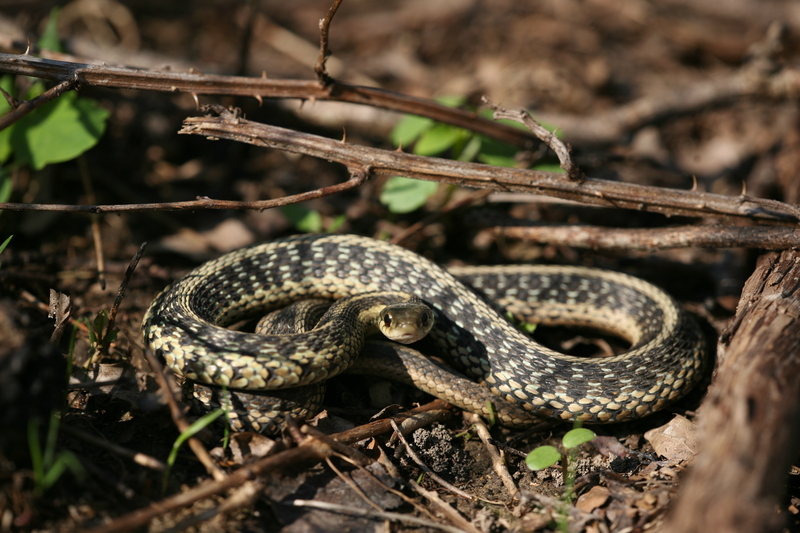 In Illinois, the Fox Snake (Elaphe vulpina) is sometimes confused with the similarly looking Massasagua (Sistrurus catenatus). Learn how to distinguish between a Fox Snake and a Massasagua using this comparison chart. "Watermoccasin" is a general term used by the public to refer to all seven species of Illinois' water snakes. Only one species of water snake, the Cottonmouth, is venomous. Snakes can be safely removed alive from a site. The easiest way to capture a snake is to lay a trash container on its side in front of a snake and gently sweep the snake into the container. Set the container upright and secure the lid. The broom handle should keep you safely beyond the snake's striking distance. Depending on the size of the snake, slide a wide flat shovel (such as a snow shovel or coal shovel) carefully under the snake, raise the shovel up quickly, and slide the snake off the shovel and into a container with high sides (5-gallon bucket or 30 or 50- gallon container). Alternatively, the tines of a potato rake or a hoe can be carefully slipped under the center of a snake to quickly lift the snake into a container. Place a lid on the container and secure it. Keep the container out of direct sunlight while transporting the snake to the release site. Release the snake in appropriate habitat as soon as possible. The habitat should be located away from roads, provide sunlit areas that are not frequently mowed, and have areas of cover, such as tall grass, logs, or rocks, under which the snake can hide. Venomous snakes use their venom to kill the birds and mammals which they eat. Snake venom may cause tissue or nerve damage to humans, but a snake bite is usually not fatal to humans if proper medical treatment is received. There are four venomous snakes native to Illinois. 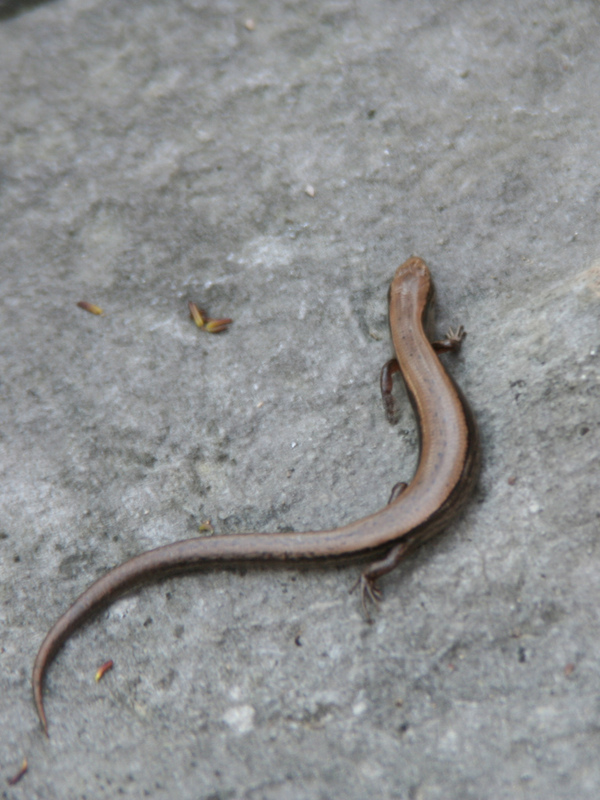 Skinks may be found around buildings and fences. They may rarely find their way into buildings or be captured by domestic cats, but they usually do not come into conflict with humans. They hunt for insects and other invertebrates in gardens and near buildings. 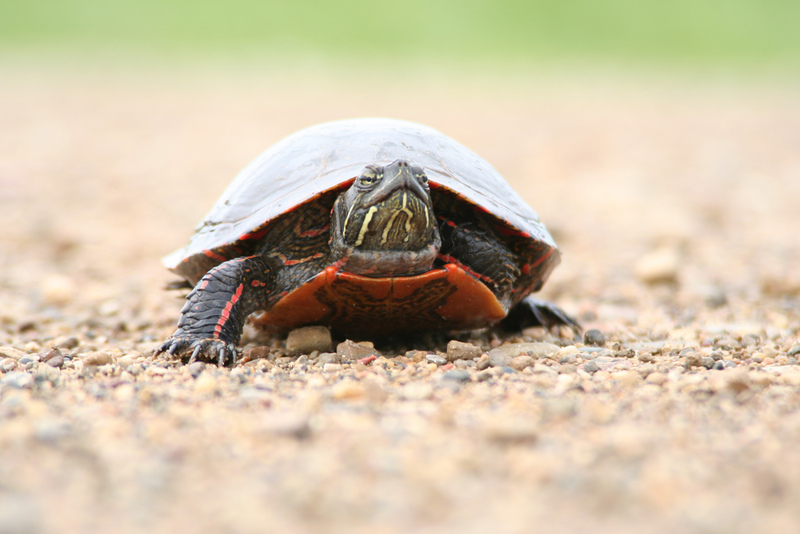 Aquatic and terrestrial turtles can encounter a number of hazardous situations in Illinois' human-dominated landscapes. Turtles may be mauled by domestic pets or mishandled by curious children and adults. Many are crushed by vehicles while they are crossing roads. Female turtles are often struck while searching for nest sites during the spring and summer months, and turtles of all ages and both sexes are struck when they migrate between water sources during the late summer and fall. Additionally, curbs along roads and parking lots and railroad tracks can trap turtles. Female aquatic turtles and box turtles may nest in mulch and flowerbeds. They also nest in exposed sand or soil in yards, along railroad tracks and trails edges, in agricultural fields, and in crushed limestone trails, especially if these areas are near permanent water. It is best to allow the turtle eggs to incubate and hatch (60 to 90 days depending on the turtle species) where the female laid them. Placing a wire basket (with a top) over the nest site can protect the nest. 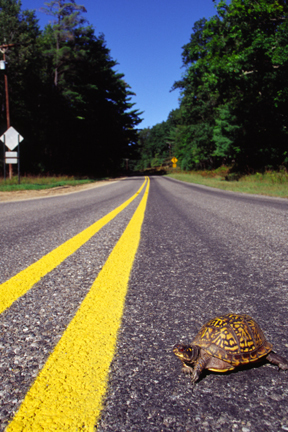 Female turtles searching for nest sites are often found crossing roads. These females may expel a large amount of water from their vent/cloaca when lifted up by a well- meaning rescuer. This water is important for moistening the soil of the nest site. If a female expels water, it is best to return her to the closest area near standing water. If the rescuer cannot find water nearby, and the female turtle has released water, the turtle should be placed in a container of shallow water for a couple of hours before being released. Do not relocate the turtle very far from where it was found. Since a turtle is familiar with its home area, it is always best to move the turtle to a safer area and situation in close proximity to where you found the turtle. Always wash hands with hot water and soap for 20 seconds if turtles are handled. Consider human safety first and use good judgment when attempting to move a turtle off a road. Consider a rescue only if you can pull safely off onto the shoulder of the road and will not be in danger of being struck by a vehicle. Turn on your emergency flashers. If a turtle must be relocated, there are several steps that you should take to minimize impacts on the turtle. 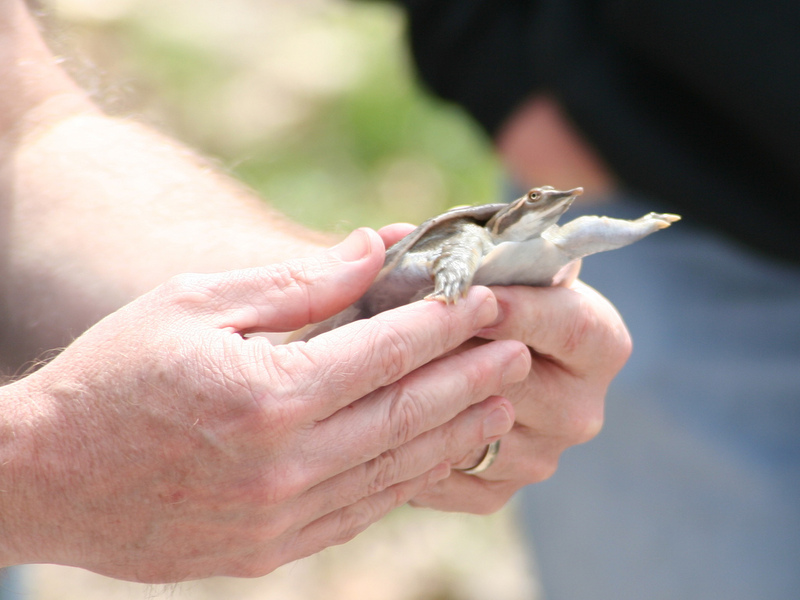 Smaller turtles can be lifted safely with one or two hands from the back (tail end) of the shell. Firmly grasp the shell from the top and bottom of the shell with the fingers and lift the turtle. Place the turtle in a container or box. All but the largest turtles can be lifted by sliding a broad flat shovel under the turtle and placed it into a container. It is not necessary to provide water as long as the turtle will only be held a few hours. Take special care when moving snapping turtles. Snapping turtles can be dangerous for an inexperienced person to handle. If you must handle a snapping turtle, always keep your hands on the hind legs or on the very rear portion of its shell. The long tail of a snapping turtle should not be used to lift the turtle, since the weight of their bodies can severe the turtle's spine. It is best to grab the snapping turtle by its hind legs (one in each hand) and use them as handles.